One common question I get is how to reintroduce meat to your diet after being vegan or vegetarian? This post include eight tips for reintroducing meat. Eating meat again after being vegan or vegetarian is a controversial topic. Folks who have made the commitment to being vegan or vegetarian don’t like to hear about people who aren’t thriving on such a strict diet. After following a 100% strict vegan diet for 3 1/2 years, I realized in 2014 that I needed to expand my dietary choices and figure out which foods really would nourish my individual needs. The truth is, being vegetarian or vegan isn’t right for everyone, and can lead to nutritional deficiencies and even disordered eating patterns. I wrote a comprehensive article with eight vegan diet dangers that you might be interested in reading. One of the vegan diet dangers can lead to irreversible health damage. One study showed that 84% of vegetarians return to eating meat again. Once you realize that you aren’t thriving as a vegetarian or vegan, you’re then faced with the choice of discarding everything you’ve come to believe, making that mental shift, and adding meat back into your diet. I get how difficult of a decision this is. The vast majority of my audience and friends were incredibly supportive when I made my announcement, but there were a few people who were unkind and cruel showed a disturbing lack of compassion and humanity. 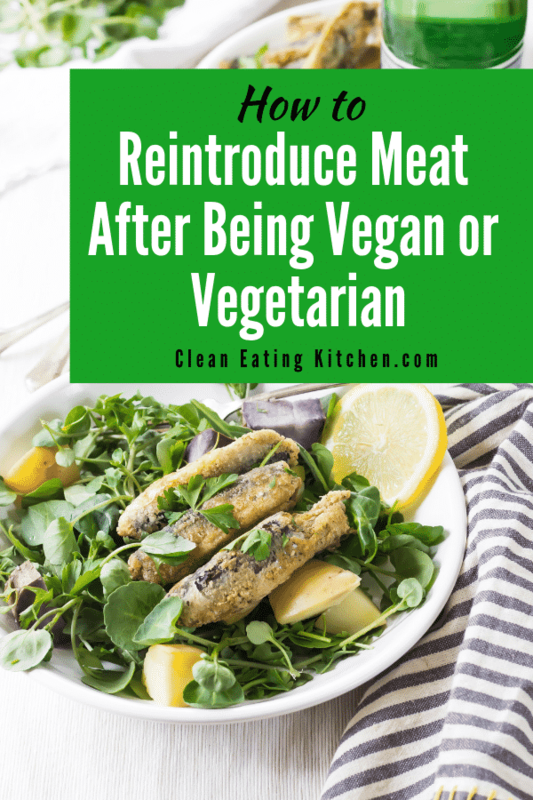 So, in order to offer support to those who are going through this tough transition, I’ve come up with eight tips for how to reintroduce meat back into your diet after being vegan or vegetarian. And, just to be clear, I’m not trying to convince anyone to eat meat or to stop being vegan or vegetarian. This post is for the many, many people who have reached out to me asking for help because they’ve realized they need to try adding meat back into their diets. Along with these tips, I offer kindness, compassion, and empathy for a very tough decision. A person transitioning from a vegetarian or vegan diet back to an omnivorous diet might want to introduce fish first, then poultry, and then red meat. If you have been vegan and are adding animal products back in, eggs might even be a better first choice before fish. It’s a very individual decision and there’s no one right way to start. Even listening to your cravings might be the best rule of thumb. I understand that some people may choose to stay away from red meat for good, but for others, red meat provides the nutrients that they’ve been lacking on a vegetarian or vegan diet. Red meat from grass-fed, organic sources is an incredible source of healthy vitamins like B12, minerals such as zinc and iron, beneficial antioxidants like glutathione, and essential fatty acids such as conjugated linoleic acid (CLA). If you’ve ever experienced or heard about the “heavy” feeling that can come with eating meat, then you might benefit from taking some digestive enzymes or betaine HCL with your meal. I like this brand (affiliate link included). The most likely reason for that heavy feeling you get after eating red meat is compromised digestion. Or, maybe you ate too much of it at one time. Those meat-digesting enzymes were taking a break when you were vegetarian or vegan, and your body might need some help. Low stomach acid is not uncommon. Your functional medicine practitioner can run tests to determine if you would benefit from taking enzymes. If you suspect that red meat is affecting your gallbladder, you may need to supplement with bile salts. It helps if you use a slow cooker to prepare your meat. You might like this recipe for Slow Cooker Brisket with Root Vegetables, for example. 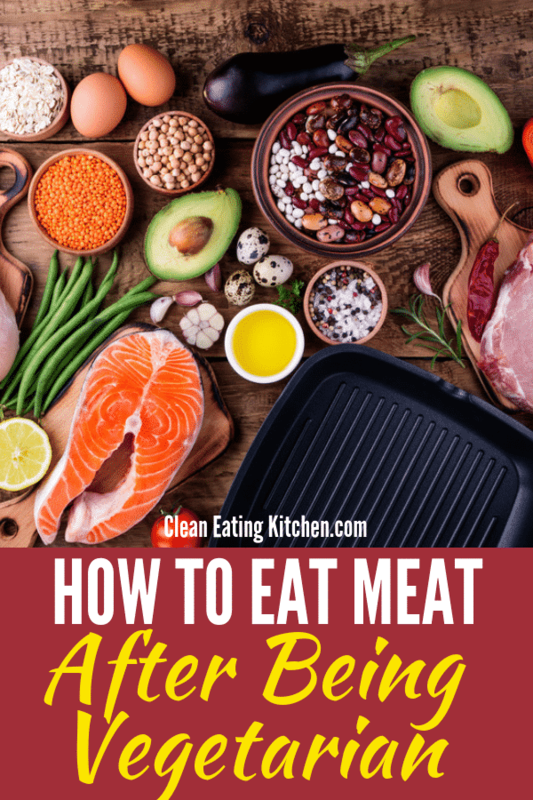 Slow cooking your meat will help break down the proteins more making it easier to digest (see all my tips for how to eat clean without starving yourself). Or, for another red meat option, you could opt for bison instead, which has less fat and may be easier for your digestive system to process. Let’s be honest, the most flavorful cuts of red meat contain more fat. If you find yourself grimacing at the taste of red meat, it may mean that you’re choosing too lean of a cut. An example is switching from consuming 99% lean ground beef to one that has an 80/20 ratio. There’s no need to fear the fat if you’re consuming organic, grass-fed and grass-finished beef. In conventionally raised beef products, toxins generally get stored in fat tissue. But in organic, grass-fed and grass-finished beef products, consuming some of the fat is actually quite beneficial. You’ll get an added dose of conjugated linoleic acid, plus the fat will help you absorb all those essential vitamins and minerals that are so plentiful in red meat. I highly recommend buying quality, organic meats from a vendor like US Wellness Meats (affiliate link included). It’s where I buy the majority of my animal proteins. Conventional feedlot beef is not a good choice for a myriad of reasons. Both vegan and paleo communities agree that factory farming is unethical, unnatural, and horrible for animals and the planet. There are quite a few companies that source their meat from organic, grass-fed and grass-finished farms. Outside of buying from local farms, you can now order online and have frozen grass-fed meats shipped directly to your door. As I mentioned above, buying from a vendor like U.S. Wellness Meats is a great option. Sarah Ballantyne from The Paleo Mom wrote an informative blog post debunking the ‘unhealthy’ myth that surrounds red meat consumption. 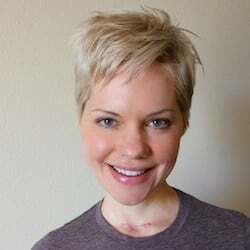 She cites studies that have shown that red meat may cause cancer. And while it’s possible that red meat does contribute to the formation of cancer, eating red meat with plenty of vegetables mitigates your cancer risk. There’s really no need to worry about red meat being unhealthy if you’re eating clean most of the time and consuming plenty of vegetables. Choosing cleaner, less processed sources of meat and not charring it helps mitigate your cancer risk as well. Even with the understanding that red meat is part of a healthy, balanced diet, people with a history of eating disorders or disease may struggle with the idea of eating red meat again. As stated above, red meat is not an unhealthy addition to one’s diet when done right. However, obsessing about restricting certain foods, such as red meat, could be unhealthy and may trigger some people to go back to their disordered ways of eating. This interesting study encourages the use of “real food” meal plans over restricted diet meal plans for people recovering from eating disorders. Getting help could include anything from working with a specialist to simply learning from informed people who have a balanced perspective. This article also provides a great balanced perspective on how the vegan talking points aren’t actually correct. The truth is, humans evolved eating a much more varied diet than most of us eat now. The variety is what provides us with the macro- and micro-nutrients are bodies need. I am guilty of eating the same foods over and over again, but I’m trying to get into the habit of ordering different types and cuts of red meat and other animal proteins when I order online. U.S. Wellness Meats is such a great source for offering a variety of meats and cuts. Leaving veganism or vegetarianism is a huge life change; many people say that veganism is less of a diet and more of a lifestyle. For me, the experience meant re-building my identify and finding new communities to join. The paleo and primal communities are filled with ex-vegans, including Mark Sisson and Chris Kresser who have each created empires around conscious food choices. A simple search on Facebook for “recovering vegans” will result in groups of people who have gone through this experience. Life transitions as big as this are always made easier with the support of others. I also have a Clean Eating Support Facebook group where questions on this topic are always welcome. Do vegetarians get sick when they eat meat? Vegetarians or vegans won’t get sick when they eat meat, but they might feel sluggish or have a stomachache if they eat too much too quickly. How do vegetarians start eating meat again? Start slowly and with small amounts. Some people might find it easier to eat fish or ground meat to start. Do vegetarians lose the ability to digest meat? Vegetarians or vegans might not be making as much digestive enzymes, so it’s not a bad idea to take digestive enzymes when you reintroduce meat. Will eating meat again make me gain weight? It depends. If you are underweight after being on a vegan or vegetarian diet, then you might gain weight once you eat a more balanced diet. Eating meat, however, won’t make you overweight in the context of an overall balanced, healthy approach. I hope you find this post helpful! Have you had experience reintroducing red meat back into your diet after deciding to transition away from being a vegetarian or vegan? Let me know other suggestions in the comments below. Don’t miss a recipe! Join my weekly newsletter list to get all the latest news and recipe links delivered directly to your inbox. Sign up now and unsubscribe at any time. I will never sell your name or spam you, I promise! A well-thought and well-written post (as is typical, considering how well you research and write!). While I am thriving on a high-nutrient, vegan food definition, I absolutely support your journey in finding what works for you. One thing I’ve always appreciated about your blog: you are compassionate as well as encouraging, uplifting and fun and witty. I am perfectly willing to accept that your choices are yours to make, mine are mine to make, and the fact that we both pursue our best possible health provides plenty of basis for online friendship. Awwwwwww, thank you, Linda!!! I so appreciate your feedback and super sweet comments. It’s been a rocky road for me, but I have so many wonderful vegan friends who have stuck with me. I am so appreciative of your willingness to love me, despite our differences. Much love back to you! XOXOXOXOXO. I wish I had read this post when I made the transition, I kind of just went in feet first. I was born into a vegetarian family and remained vegetarian until the age of 23. I’d met my now husband, who is French (typical meat at every meal) and I remained vegetarian for our first year together, then he was cooking something and it smelt soooooooooooo good. This was unheard of for me because I could never stand the smell of meat cooking, it would make me feel sick. This particular dish was slow cooked turkey with honey, mint and mustard. I can still remember his face when I asked him if I could try it, he said “you do realise it has turkey in it”. That was it, that was my first step into eating meat. Funnily enough when I was pregnant I couldn’t stand the smell or sight of meat. Although I eat meat I find myself buying good quality, well reared meat and I don’t like fatty meat. I do still cook like a vegetarian though, lots of vegetables, spices, beans and lentils. In a way I’ve simply added meat to the dishes I cooked previously. Thank you for explaining the problem with feeling heavy when eating meat, I’ve had this when eating with my husband’s family as there literally is too much meat for me. It makes sense now. We had a relative that went from being vegan to eating meat after few years. They did similar stuff. Wish I could have shown them this post. This is so interesting. I never thought about having to reintroduced yourself to meat. That would be difficult. I never thought about having to slowly introduce meat again after not eating it for so long. I’m not vegan or vegetarian, but my oldest son doesn’t like much meat so I wouldn’t be surprised if he is vegetarian in the future. I have been a pescetarian (I eat fish) for more than 8 years and it was one of the best decisions I ever made. But I appreciate this guide – in case I ever have to go back to eating meat. I am saving this post because it is so incredibly helpful! I wish I had known these tips before! This is really helpful! I was a vegan for a few months, because of a book I read, but it was really hard to maintain that kind of lifestyle. I’m definitely meant to eat meat. Wow, I love the information you provide here as well as your attitude of acceptance. My husband of 12 years is a vegetarian, but he will occasionally join me on a “diet” endeavor that includes meat. It’s an ethical decision each time, but he does it out of support for me and with the caveat that we choose healthy, humanely sourced meats. It’s an interesting dynamic that works for us, but it’s not something he advertises because people can be so judgmental about that choice. 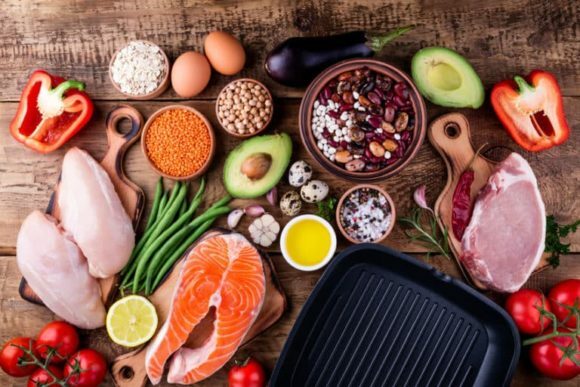 It’s so true that different seasons of our lives call for different things, and there are still responsible and healthy ways to incorporate meat into your daily meals. I am a vegan now. I ate meat and fish before. these tips are really helpful for me. This is so helpful! I am always on the fence about eating meat and not eating meat. But I don’t want to have my body get used to a certain diet and then have to eat that way forever so I try to do a moderation of everything! One of my friends was on a vegan diet for years. When he Reintroduced meats on his diet, he said it is not easy at first. I am not vegan or vegetarian but this article helps me a lot very informative, well-written and well-thought. Wow, I had no idea that so many vegetarians became meat eaters again. I’ve always toyed with the idea of becoming vegetarian, but this has definitely caused me to think and maybe instead focus on reducing my meat intake. I was also shocked at the 84% of vegetarians going back, but I can see why it is somewhat difficult because of the potential nutritional deficiencies. I am pretty much 70:30 with quality animal proteins and organic veggies, ketoish. Thanks for a fabulous post. Sharing it with <3 with my readers in my official. I have been vegetarian for 2 years and just decided to go back to meat as I thought I was lacking in vitamins only found in meat. I have been introducing it slowly but still feel nauseous and a bit light headed and dizzy and just wanted to know if that was normal. Good question, Jess. There are so many reasons why you could be feeling those symptoms. It’s beyond what I could help you with over e-mail, so I would suggest finding a practitioner to help. It’s important to rule out any serious causes or nutritional deficiencies. But, a few thoughts are that you might try taking digestive enzymes, and also might trying different types of meat in case you’re sensitive to one or the other. It would also be helpful to keep a food diary so you can really pinpoint which food might be causing a problem. What do you think of these ideas? I really appreciate this post. I’ve been vegan for 2 years and I was thriving until the last 6 months. It was slow. Some cravings here and there, but I could ignore them. Then in the past 3 months it got worse. I did a blood test not too long ago due to gastritis and I actually looked at the results and I was low in B12, vitamin D, calcium, and iron. I gave up Caffeine month ago and I thought my constant exhaustion was due to that till I saw my iron levels, I’ve also been severely anxious and depressed. And I’ve had serious intestinal issues in the past 6 months along with a myriad of other health issues. And I just feel wrong. So. Thank you so much. Because I know what I have to do for my health, and your compassion in this article is extremely helpful. Thank you for sharing your story, Danielle. I can so identify with the health issues as a result of a vegan diet that just wasn’t working for my individual needs. I hope you are doing better now and I appreciate your kind words. I’m SO glad my article was helpful. XO. Awww, McKenzie, thanks for sharing that. I’m sending so much love and empathy for what you’re doing through. Please keep me updated on how you’re doing, and let me know if I can help in any other way. XO. I gave up chicken and meat for moral reasons. I have been vegetarian (Lacto-ovo) for 7 years now. My diet consists of pastas, beans, veggies, fruits and cheeeeeses. 3 months ago, I did a 3 weeks diet based on dates, yogurt and eggs. When I went back to my normal diet I started to feel bloated and constipated all the time. So now I need 3 days to digest a plate of black beans stew. No meat ever in my life (Cow is a mammal just like us) But chicken yes I want to sacrifice few chickens on earth for me not feel bloated and constipated all the time.